How Domestic Violence In One Home Affects Every Child In A Class : NPR Ed New data shows violence in the home hinders the academic performance of their classmates, too. Reporting domestic violence makes a big difference. 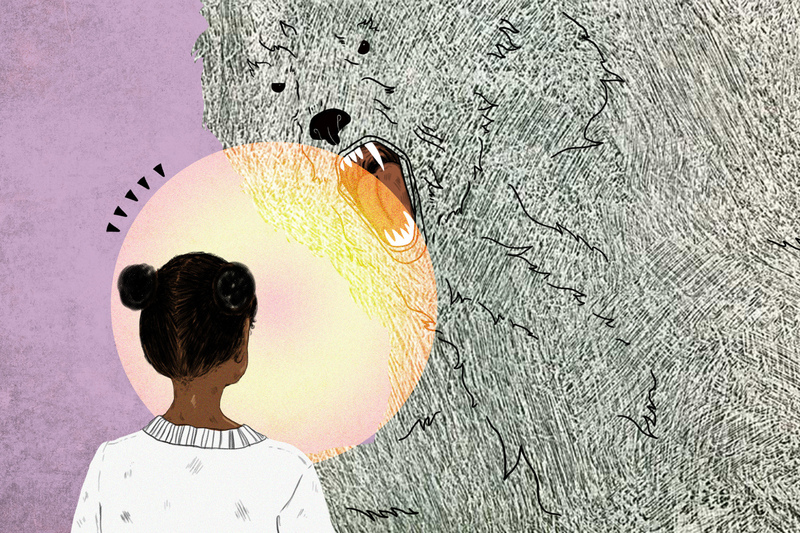 Part of our NPR Ed series on mental health in schools. Every Monday morning at Harvie Elementary School, in Henrico County, Va., Brett Welch stands outside her office door as kids file in. "The first thing I'm looking for are the faces," says Welch, a school counselor. She's searching for hints of fear, pain or anger. "Maybe there was a domestic incident at the house that weekend," says Welch. "That's reality for a lot of our kids." And a reality for a lot of kids in the U.S. While it's difficult to get an exact number, researchers estimate that between 10 and 20 percent of children are exposed to domestic violence each year. New data quantifies what many teachers and school counselors already know: While such violence often takes place outside of school, its repercussions resonate in the classroom. It hurts not only the kids who witness the violence, but also their classmates. The harm is evident in lower test scores as well as lower rates of college attendance and completion. And the impact extends past graduation — it can be seen in lower earnings later in life. "It's a sad story," says Scott Carrell, economist at the University of California, Davis, who has studied this for over a decade. But, he says, there's one thing he and his colleagues — economists Mark Hoekstra and Elira Kuka — found that can improve the situation "not only for that family but for all the child's classmates." What was it? Reporting domestic violence when it happens. Brett Welch says she's noticed that kids who act out at school often come from tough home situations. "Instead of asking for help, they'll start being disruptive," Welch explains. "They'll ask to go to the bathroom for the 15th time. And when they can't, they'll raise their voices. It can get to the level of throwing a chair — but that's very rare." Kids who witness domestic violence are more likely to get in trouble at school and have behavioral problems, including being aggressive and bullying their classmates. Welch says she understands why: School is "where they can feel powerful because they are completely powerless at home." She often works with those kids one-on-one or in small groups. She wants them to have at least one relationship where "they feel listened to and they feel respected and they know someone cares. That can change everything for them." Around the country there aren't enough counselors like Welch to go around. Not all states require elementary schools to have counselors. And even where they are required, there can be large caseloads. Sometimes one counselor covers multiple schools and oversees more than 1,000 students. Welch is stretched so thin she's only at Harvie Elementary two days a week. But a kid may need Welch's support at any time — and mornings in particular are key. The first 10 minutes after a student arrives at school in the morning is a critical window, Welch says. If she's able to catch them and make them feel heard, "it can completely change their day" — and it can change their classmates' days, too. If one kid is having a hard day, Brett Welch says, it influences the rest of the children in the classroom. "It takes the teacher's attention, it interrupts learning and it interrupts the flow of the day." She says she can see the impact on classmates' academic work. Scott Carrell's data confirms what Welch has observed. He links lots of academic metrics — like test scores, discipline infractions and college graduation rates — with court records on whether a parent has filed a restraining order. Now, domestic violence and restraining orders happen in all the schools Carrell examined. But they were 10 times more likely to happen in the school serving the poorest population compared with the school serving the wealthiest population. So to make sure he wasn't just seeing the effect of poverty, Carrell came up with a clever solution. He looked at siblings who come from the same family and go to the same school, but one sibling has a classmate who's struggling with domestic violence and the other sibling doesn't. Examining lots of sibling pairs and crunching almost two decades worth of data, Carrell found that your classmates, and whether or not they come from a home with domestic violence, influence how well you do in school and beyond. Measuring harm in dollar figures, Carrell looked at wages when the students grew up. He found that: "exposure to an additional disruptive peer throughout elementary school leads to a 3 to 4 percent reduction in earnings at age 24 to 28." Carrell says that number adds up quickly — because, in a class of 25 kids, that's a 3 or 4 percent drop in wages for each person. Plus, if your classroom has multiple children from troubled homes, the tests scores get lower and lower and the wages drop gets bigger and bigger with each additional disruptive child. Carrell argues this has implications for how to make schools and classrooms fair. He says, ideally, we would avoid concentrating disruptive kids in the same classroom or the same school. And Carrell says his biggest takeaway is that "society has a vested interest in helping those families that are struggling with domestic violence. The more we can help other households, the better off our children will be." Carrell and his colleagues found one thing that, they say, really helps: parents reporting the domestic violence. After reporting it, "things get better." Carrell says there are three things that might account for this: First, the violence in the homes may have stopped. Second, another adult has decided to make some positive changes in the child's life. Third, people like Brett Welch get involved. Reporting domestic violence forces the school to pay attention, and often that means the school counselors get involved. Welch talks to students about finding safe places in their homes. She works on anger management. She helps kids improve their emotional vocabulary. Vickie Fahed, a kindergarten teacher at Harvie Elementary, says she can see Welch's impact on a child. When Fahed has angry or disruptive children, she sends them down the hallway to see Welch. "The child comes back so relaxed and so at peace," Fahed says. When that child is at ease, the whole class can focus. That translates into higher test scores and better graduation rates for the child and their classmates. All this is great — at least on Mondays and Thursdays, when Welch is here. "You can tell when she's not here in this building," says Fayed. "It's a big difference. We're like: 'OK, she's not here today? OK, wait till tomorrow.' "
On the days Brett Welch is in the building, she stands by the door as students leave. "You tell them that you love them because you do," Welch says. "And because maybe that's what they need to be able to get through whatever they need to get through at home." And, both Brett Welch and Scott Carrell say, if the child's home life gets better, things will get better at school — for that child, and for their classmates.